For this part of the challenge I had to get inspired by my favourite song. That was quite challenging, because I love a lot of different songs. When I started thinking about which one would I choose I only thought about latest hits, because I do listen to them all the time, I wanted to do Call Me Maybe, Goin', Back In Time...., but in the end their lyrics seemed way too superficial for a challenge like that. Then I started thinking about Queen and one of my favourite bands Nickelback, but I still couldn't pick a song. Just when I was about to give up it hit me! I was playing song pop( FB application) and I got challenged in GLEE . Why not get inspired by such a meaningful, beautiful song like Imagine? Of course I know that this song was not written by GLEE, but I really love the start of this song. Deaf people singing this song. There is not a better way to represent the lyrics and the meaning of a song. 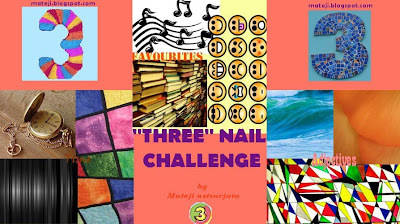 Here is a video of a song, please take those three minutes( irony three challenge, three minutes) and listen to it! I put love and peace over white, because white is pure and represents fresh start. On my ring finger I tried to to the uniform of the deaf people ( I kinda failed that). And on my index finger I just ran out of inspiration and simply write imagine with 3( again three) dots which represent that we are really far away from a place like John Lennon wanted to have. What do you think? Did I fail or succeed in recreating such a meaningful son?